The Estacada Public Library will soon join organizations around the country in celebrating Hispanic Heritage Month. From Sept. 15 through Oct. 15, programs at the library will highlight the culture and contributions of Hispanic Americans. In the U.S., the observation began as Hispanic Heritage Week in 1968 under President Lyndon Johnson. It was later expanded to a 30-day celebration by President Ronald Reagan. The Estacada library held its inaugural Hispanic Heritage Month festivities last year. 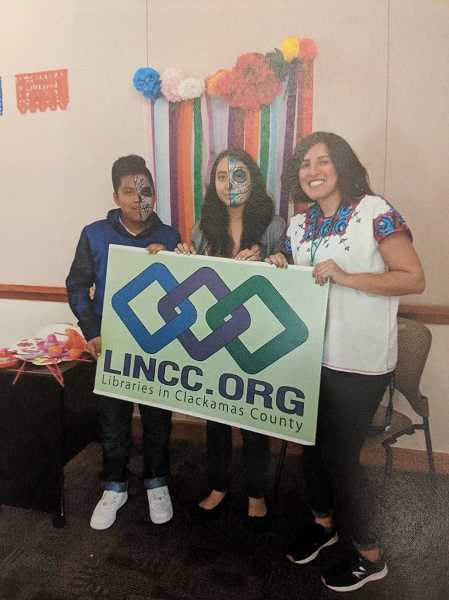 "It's important to celebrate the history, culture and contributions of Hispanic Americans," said Alice Perez Ververa, a member of the Estacada Public Library staff who is coordinating the observation. Activities for adults will include a salsa cooking class and a salsa dance lesson, and family events will include a Loteria game night and a sugar skull decorating workshop. Additionally, there will be a Day of the Dead celebration in November. Perez Ververa is looking forward to all of the events. "They're all my favorite in different ways," she said. She added the sugar skull decorating is a new addition this year and she is excited for participants to learn about the history of the tradition. Last year, the Day of the Dead celebration was popular among attendees. The holiday is a celebration of friends and family who have passed away. "I loved seeing everyone's faces painted, and seeing painted faces at the library after (the event)," Perez Ververa said. She encouraged anyone interested to stop by the Hispanic Heritage Month activities in the coming weeks. "You don't have to be Hispanic or Latino to attend," she said. In the future, Perez Ververa is interested in planning events for Black History Month, Pride Month and Asian Pacific American Heritage Month. "As a library, we need to represent all cultures because everyone is welcome here," she said.